Summary: During the First World War, the French military orders a court-martial accusing soldiers of cowardice after an attack on an enemy position fails. 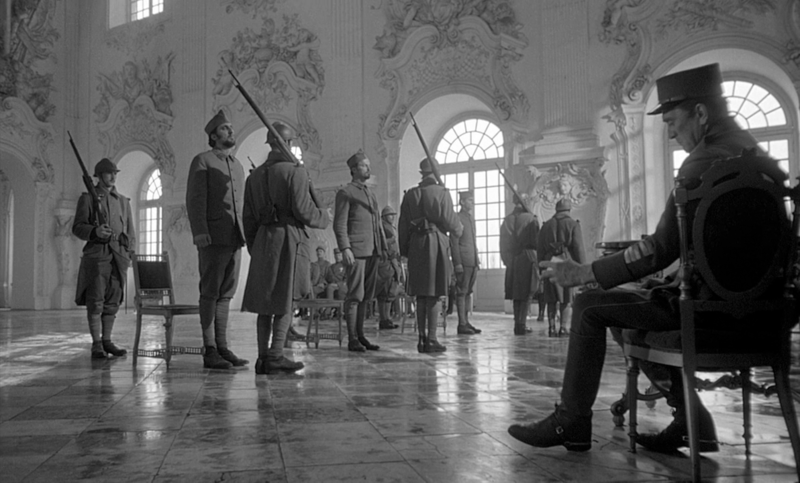 Paths of Glory is shot in crisp black and white. It has long tracking shots across No Man’s Land and winding along through trenches, and a clever, startling moment utilising deep focus photography. We are looking across a muddy field at a crashed bi-plane when a flare lights up overhead, illuminating the foreground to reveal that the shadowy lumps aren’t rocks or muddy knolls but corpses. The flare dies out and the corpses are once again put in darkness. There is a very realistic, dirty, brutal battle scene. The film is gritty about the brutality of war and the bloody-mindedness of the military mentality. A general refuses to believe that a solder is shell-shocked (as he refuses to believe there is such a thing). Another officer regards ordinary soldiers as “scum” acting as if they have a herd mentality. In some ways it is harrowing to watch because you know what’s going to happen and few seem interested in stopping it. For a film generally remembered as a harsh examination of the pity of war, it has scenes that are highly stylised, with theatrical blocking and some of the dodgiest acting this side of an am-dram production. The actors aren’t really playing people, but stock-types: coward, brigand, rebel, tyrant, and so on, and many of the scenes (particularly in the first act) are simplistic moral or philosophical arguments disguised as drama. And right in the middle is jutting his jaw and sucking in his gut (I always imagined he insisted on a scene where he is bare-chested) and getting righteous and angry. It’s a very typical Douglas performance, which is not to say it’s bad, and he’s virtually the only human in the film, which is to say he’s the only character who hasn’t been turned into a cog in the military machine. Once the court-martial begins, the absurdity of the situation and the way in which Douglas is prevented from presenting a proper defence will have you wondering if the military really can be this stupid. Three men are selected to be tried for cowardice. One (Ralph Meeker) is the corporal who threatened to expose his lieutenant’s cowardice; one has his name picked at random (Joseph Turkel); one is considered ‘socially undesirable’ (Timothy Carey): the film doesn’t expand on that, so you can imagine anything you want (it might simply be because he looks like a peace-loving beatnik). As with much of Kubrick’s work, there is an awful lot of formal composition in the frame, and to further belittle his characters he places them in the cavernous rooms of a chateau. This is a very loud picture: you can’t ignore the sound of footsteps on marble floors, nor can you ignore the obvious contrast between generals calmly discussing brutal acts while sitting on beautiful furniture surrounded by Renaissance art. And I don’t think it’s an accident that the execution of three soldiers is framed in a way that will make you think of Calvary. What redemptive power is there in this crucifixion? The film has a curious coda, which seems to belong to a different film. A group of drunken soldiers listen to a young German girl sing a song that reduces them to tears. It’s a moment of strange and sad beauty, a brief reprieve from the war, and a rebuke to the blind patriotism. The song is ‘Der treue Husar’ (The Faithful Hussar), which might make you think it’s a flag-waver, but it is in fact far more personal. It’s a folk song about a soldier who leaves the Front to be by his dying sweetheart. Incidentally, the pretty blond girl singing it is German actress and painter Susanne Christian, the future Mrs Kubrick. As always Niall, an intelligent and well-informed review. Despite your misgivings, I feel that this film has always worked well for me, and it is one of my ‘Kubrick favourites’. Many of the aspects that you find disconcerting are exactly the things that I like about it. I can find fault with it in some areas, but on balance, I believe that it remains powerful, and rewards the viewer. Incidentally, my own review, less incisive and more praiseworthy, can be found here. I agree with Pete. Having said that, it took many years before I could bring myself to watch it because I loathe Kirk Douglas. In spite of that, I find it a powerful film and Douglas even recommended himself to me with his playing of the part! In the historical context of 1950s America, a powerful anti-war film was pretty bold step for Kubrick. Dissent at that time was professionally and personally risky. Kubrick couldn’t get a studio to make this film in the McCarthy Era, until Kirk Douglas got behind it, which increases Kirk’s stature in my eyes. The view of the venal generals and the soldiers as cannon fodder would also have been out of the mainstream then, to say the least. Kirk is at his best indignantly challenging the kangaroo court. 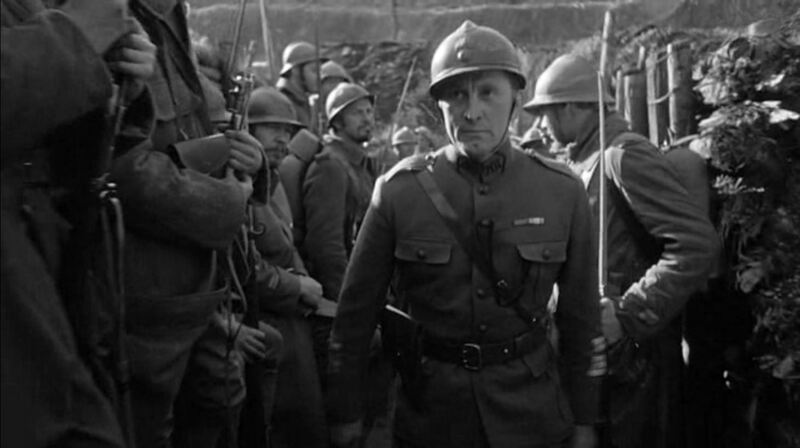 That last scene with the German girl singing to the French soldiers, opening to catcalls and jeers, then winning them over, and ending with these hard-bitten men choking back the tears, is one of the great scenes in film, in my opinion.